Coomer v. Kansas City Royals: The case of the killer hot dog toss. Baseball fans should be protected from getting injured by the antics of team mascots. Kansas City Royals mascot Sluggerrr. Can a hulking man in an outlandish costume fire a projectile into a crowd, hit someone in the eye, and get away with it? Maybe—if the costumed guy is the Kansas City Royals mascot, and the projectile is a hot dog that’s fired into the stands during a baseball game. Coomer v. Kansas City Royals, currently before the Missouri Supreme Court, is a law professor’s dream and a case with major implications for baseball and other spectator sports. The hot-dog throw and antics like it have become a big part of the fan experience, and the risks have increased right along with the diversions. A judgment for the guy who got hit in the eye, and against the Royals, could nudge teams toward greater fan safety for entertainment that’s not part of the game taking place on the field. On Sept. 8, 2009, Robert Coomer, 50, was sitting in the stands with his dad watching the Royals game. As he knew from his many previous visits to the ballpark, the space between innings, batters, and even pitches, is jammed with constant entertainment. The hot-dog toss is one of the most “venerable” of these distractions (to pluck an adjective from the Royals’ brief to the court). Sluggerrr, a goofy lion mascot, is played by John Byron Shores, who is 6-foot-3 and weighs 220 pounds. He turned his back to the crowd, and then, fired underarm into the stands. Coomer, who’d looked away to check the out-of-town baseball scores (he’s a Tigers fan) was smacked in the eye before he knew what hit him. He suffered a detached retina, and has since needed surgery for a cataract. A jury ruled that Coomer was to blame for his own injury, because he wasn’t paying attention to what was going on. The state appeals court threw out the verdict, finding that the trial judge had made a mistake in instructing the jury that if they saw the threat of getting hit during the hot-dog throw as inherent to the risk of attending the game, they should find in favor of the Royals. According to the appeals court, the case shouldn’t have been framed that way, because the risk of the hot-dog throw isn’t like the risk of being hit by a foul ball. The Royals continue to argue, to the contrary, that a fan who attends a game accepts the risk of all the folderol that goes with spectating, including the hot-dog throw. “Mr. Coomer was equally a spectator to the Hotdog Toss as he was … to the game … on the field,” the team’s lawyers write. But that argument is too simple. During argument before the Missouri Supreme Court, one justice suggested that the real issue was whether the hot dog had been thrown safely or carelessly. As the justice stated, Sluggerrr had “winged” what the Royals call “the accident hot dog” at the plaintiff. That’s the right distinction to draw. Consider the differences between getting hit by a ball that goes foul or is errantly overthrown past the first baseman, and the risk of being pelted by a hot dog. Baseball can’t be played without foul balls that go into the crowd, along with the occasional splintering bat. When these missiles find and injure fans, courts usually hold that the customer has assumed the attendant risks. Same thing with hockey pucks or tennis balls that fly into the stands—the players are just doing their jobs, and errors are part of the deal. The hot-dog throw is different, as is the T-shirt launch and even a player’s tossing of the ball into the stands at the end of an inning. Teams and their mascots should have an obligation to make these promotional moves in a way that minimizes the risk of injury. The backstory in this case highlights the point. Shores wasn’t the only Royals employee who pitched dogs into the stand, and he acknowledged that other employees threw the dogs “quite a bit softer” than he. Donald Costante, his supervisor, had previously expressed concern with Sluggerrr’s zeal, and instructed other employees to make sure he threw the franks in a gentle arc, and only after making eye contact with fans at close range. Costante was right to be concerned, because the previous year Shores had hit another guy, named David Allen, in the face so hard that his glasses shattered and he got a black eye. The Royals should have compensated Coomer for his injuries, which could easily have been avoided. 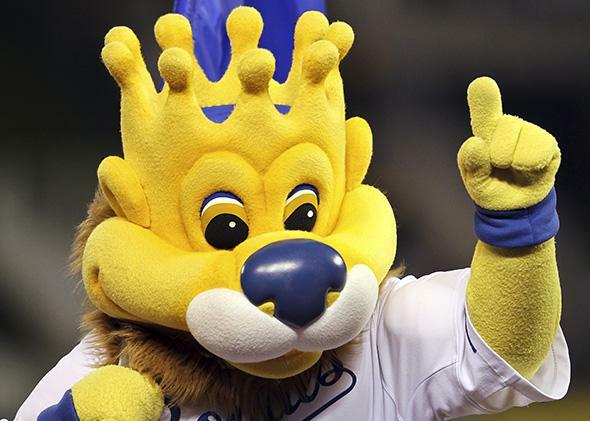 Since they didn’t, the court should rule against the team, and find that the Royals have a duty to rein in Sluggerrr. He has to get zany more safely.